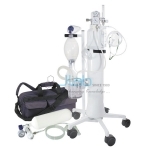 Jainco is a leading Oxygen Therapy System Manufacturer, Oxygen Therapy System Suppliers, Oxygen Therapy System in India, Oxygen Therapy System Exporter, Supplemental Oxygen, Hospital Equipment Oxygen Therapy System, Oxygen Therapy Equipment, Oxygen Therapy. Oxygen therapy, also known as supplemental oxygen, is the use of oxygen as a medical treatment. This may embrace for low blood oxygen, carbon monoxide toxicity, cluster headaches, and to keep up enough oxygen while inhaled anesthetics are given. Long-term oxygen is often useful in people with chronically low oxygen such as from severe COPD or cystic fibrosis. Oxygen can be given in a number of ways including nasal cannula, face mask, and inside a hyperbaric chamber. No other raw material is needed except air low consumption of power and low cost of Oxygen production. No failure-prone solenoid valves. 40 fewer pneumatic connections. 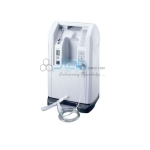 Offers a broad therapy spectrum with 0.5 to 5 liters O2/min.